Posted by Jace Stolfo on Thursday, October 31st, 2013 at 12:38pm. If you're considering putting up your Boise home for sale, you've undoubtably considered or at least have heard about home staging. However, there are many misconceptions about home staging. It's more than just cleaning up your home so that it looks nice, although that's certainly part of it. It really can be likened to your home's coming out party. It shows your home in its best light and at its best angles, allowing your home's next owners to envision how they could make your home theirs. You might love every personalized nook and cranny of your Boise home for sale, but if your home looks too much like you, possible buyers won't be able to imagine it looking like them. That's a problem. For them, it'll remain just another piece of Boise real estate instead of their new home. You want to go with neural colors and few knick knacks if you can. And get rid of any artwork or other items on the wall that may be questionable. Remember, not everyone likes modern art or cowboy chic. Additionally, a neutral paint like eggshell or taupe will make the walls more appealing to home buyers. Neither of these options cost very much and can go a long way to helping you sell your Boise home. The clutter in your home will have the same effect as having a home that's not neutral enough. Your clutter is exactly that, your clutter. While it may bring on memories of Christmas pageants at your kids' schools, family holidays spent together and summer vacations taken together, it doesn't do much for a potential home buyer to imagine building his or her own memories in the house. Clutter also makes your Boise home appear smaller, look less organized and introduce an unintended element of chaos into the visual landscape of your home. A de-cluttered version of your home could be the difference that sets it apart from other pieces of Boise real estate for sale in your area. A good rule of thumb is to get rid of your clutter by at least half. The beauty of staging in the world of the Internet is that when you take photographs of your home, you're taking them of your home's best angles. Since most people shop online long before they ever get into the car to look for their ideal Boise home for sale, make sure that the photos of your home get taken from the best angles. What the Internet revolution has done for homes sales is this: You can give your home's best attributes all of the attention in your online efforts. For example, maybe you have a huge kitchen, but a not-so-sizable backyard. 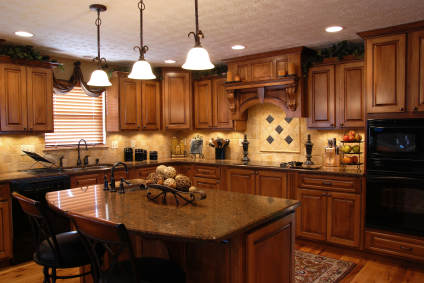 Extra photos of different parts of your kitchen that show off its size will appeal to the home buyer who is looking for a Boise home for sale with a large kitchen. This is especially important when you consider that a majority of people buy their homes in part because of the kitchens of their homes. On the other hand, if you know that you want to market your home to someone who wants only a backyard and to live the patio lifestyle, then that's what your photos will emphasize.